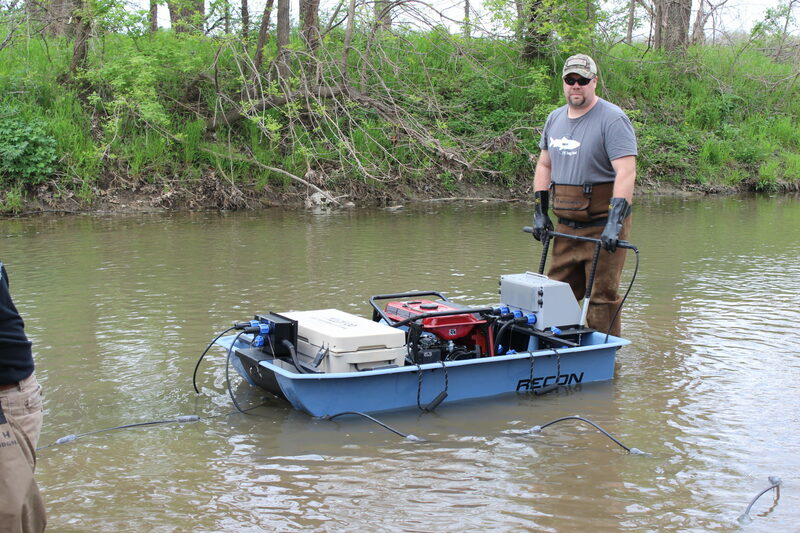 Introducing the Recon mini boat electrofishing system for use in streams and various shallow water habitats. 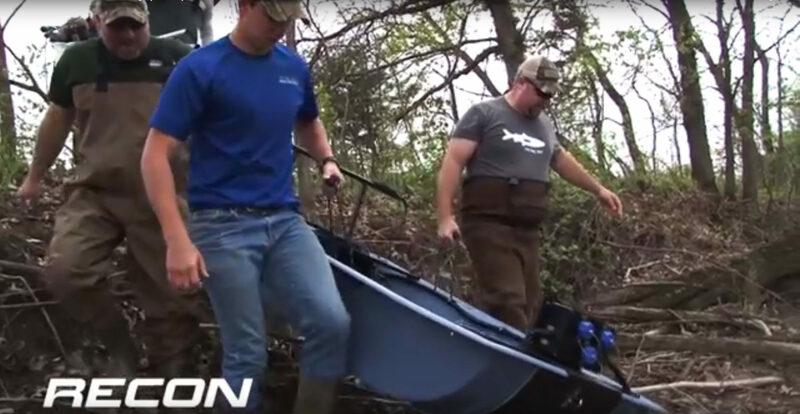 The Recon is extremely tough and sturdy yet lightweight. 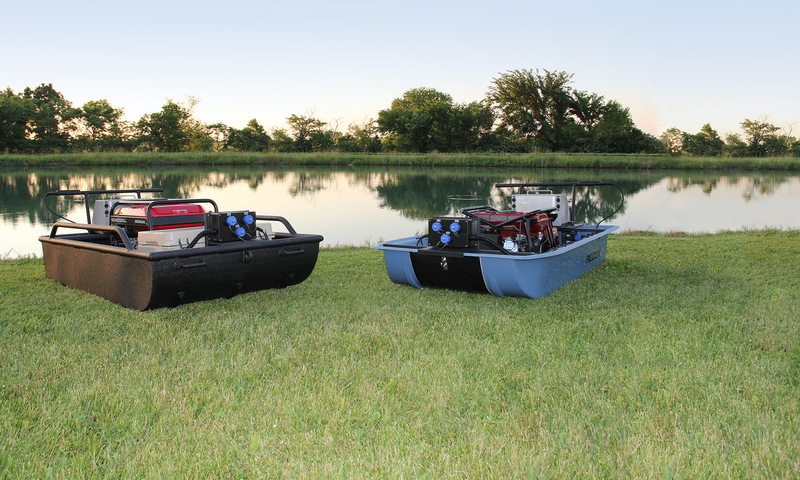 The hull is crafted from rugged fiberglass with a premium gel coat finish. The gunnels and corners are re-enforced for added strength where it’s needed most. 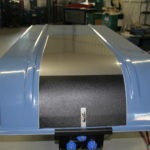 Aluminum cross bracing is embedded into the floor of the boat to enhance structural integrity and to serve as a platform to mount the generator. The Recon has strakes molded into the bottom of the hull for added strength, but they also create a recessed pocket to better protect the stainless steel cathode plate. We’ve incorporated custom built racks and bracketing to secure key operational components such as either of the Infinity Series control boxes. The removable rack system is crafted from a polymer coated, lightweight marine-grade aluminum. Corrosion resistant stainless steel hardware is used throughout. The electrical junction boxes are waterproof; feature easy to grip, ergonomic connectors; and include heavy-duty, waterproof electrical cables with protective coverings. The base model is equipped with three anode receptacles; however, it can be customized to meet your needs. 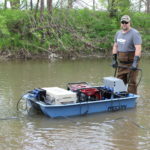 The system includes durable anode poles with safety switch and floated, waterproof cabling. Additionally, the handle bar with safety switch is adjustable and removable. 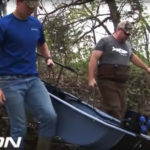 A pair of comfortable grab handles on each gunnel makes lifting and transporting the Recon a breeze. A stern drain plug is also provided for your convenience. 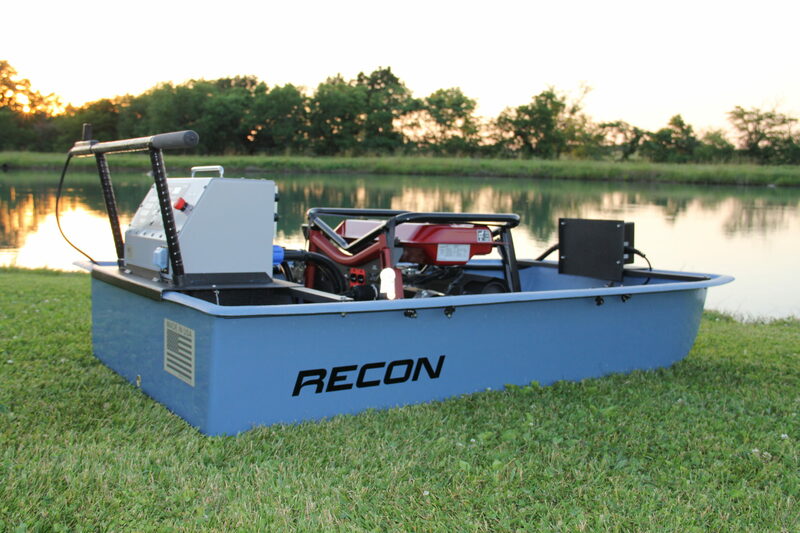 The Recon is yet another example of high quality sampling equipment developed by Midwest Lake Electrofishing Systems based on input from fisheries biologist just like you. 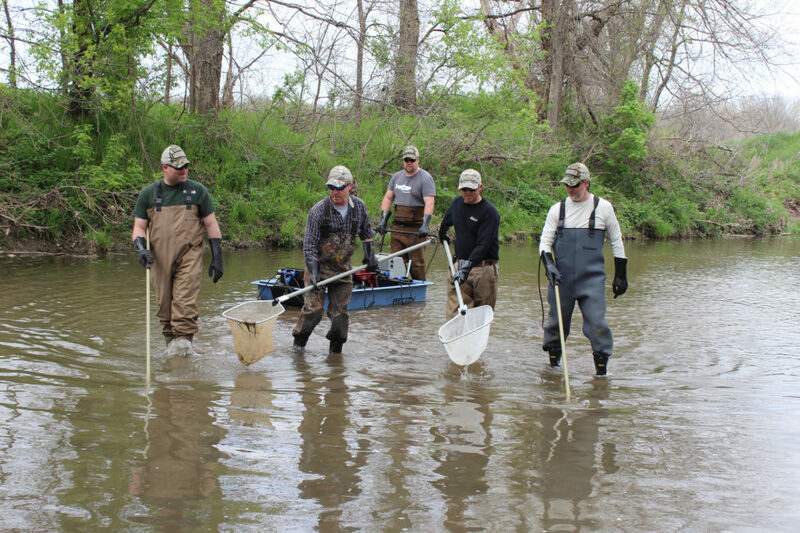 Energize your water with quality equipment. 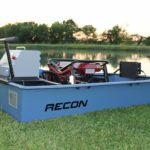 Use the Recon mini boat electrofishing system. Hull crafted from strong, lightweight fiberglass. Reinforced at corners and gunwales. Premium gel coat. Tapered design fits easily in the back of short bed trucks. 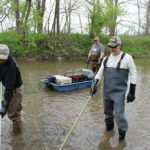 76″ L, 47″ W at stern beam, 38″ at stern bottom, 12.5″ H to gunwales. 75lbs empty boat weight. 111lbs boat with cords, junction boxes and brackets. 2-3″ draft fully loaded. Standard boat drain hole at stern w/ plug. Strakes molded in bottom of boat for better handling, strength and hull/cathode protection. 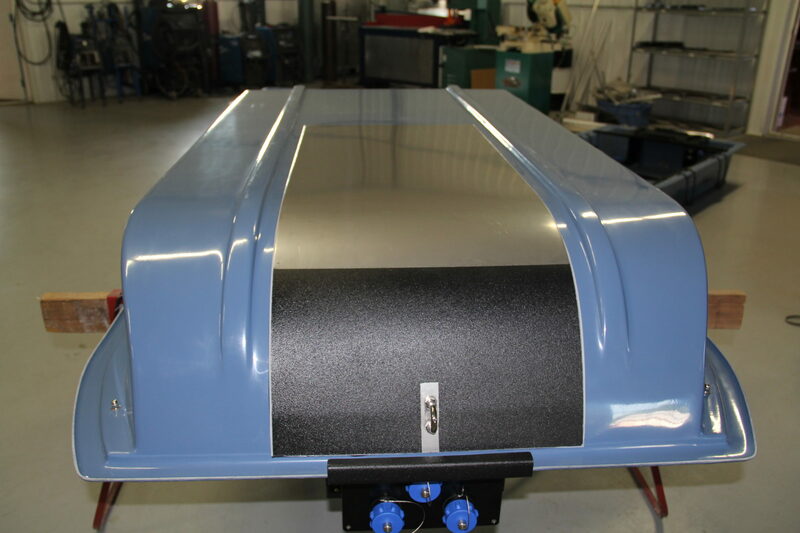 Stainless steel cathode plate attached to bottom of hull & recessed between strakes. Fiberglass-encased aluminum support bracing for mounting generator. Coated aluminum brackets for mounting and stabilizing electrofishing control box and junction boxes. Safety switch system integrated into boat push handle. Weather-resistant junction boxes and cord assemblies integrated into system. Utilizes IP68 rated plugs and receptacles. All mounting hardware is 300 series stainless steel. Heavy 3/8″ stainless steel bow eye for towing and tethering anode cables. 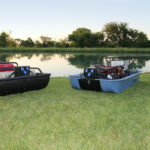 Equipped with 4 gunwale handles w/ comfort grips for easy lifting and transport. Customizable for 2, 3 (standard), or 4 anode users. 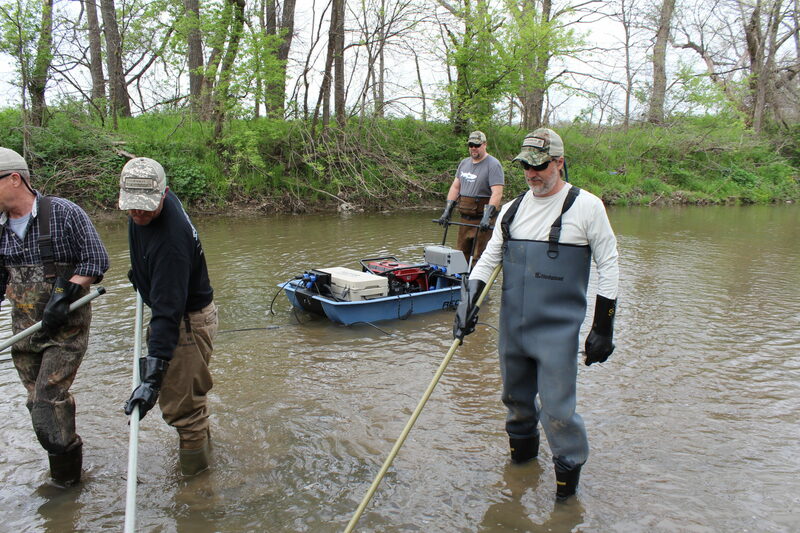 Heavy duty anode poles with integrated safety switches & 20′ floating cables.